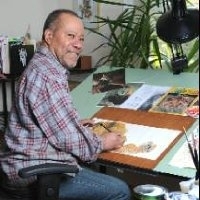 Jerry Pinkney has been illustrating children’s books since 1964, illustrating over one hundred titles and has been the recipient of five Caldecott Honor Medals, a Caldecott Medal, and five The New York Times “Best Illustrated Books.” He has received five Coretta Scott King Awards, and four Coretta Scott King Honor Awards. His books have been translated into sixteen languages and published in fourteen countries. Furthermore, he has received numerous awards for a body of work. The Society of Illustrators in New York, NY has presented Jerry with four gold medals, four silver medals, the Hamilton King Award, and in 2006 their Original Arts Lifetime Achievement Award. In 2011, he was elected into the Society of Illustrators Hall of Fame.